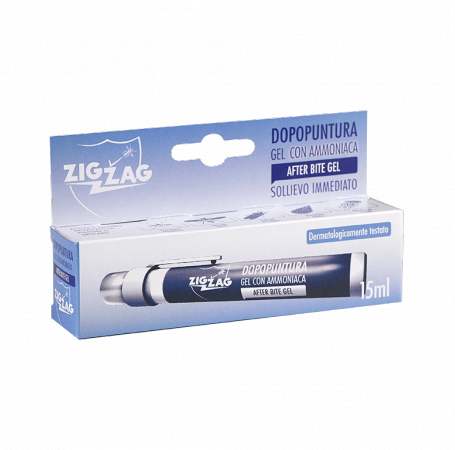 Zig Zag Pen Dopupuncture Gel, thanks to the action of a solution containing ammonia, immediately relieves the sensation of itching in case of bites of mosquitoes, flies, wasps, tafani, ticks and insects in general, or in case of contact with Urticant Plants or Jellyfish. Its natural components (aloe, calendula, camomile and mallow) and glycerine, favor the decongestant and refreshing action, prolonging the feeling of relief. Non-greasy and leaves the skin refreshed and delicately scented. With practice pen promptly apply the gel on the skin, discomfort in theaffected area, and massage until completely absorbed. Avoid eye and mouth area. If necessary, repeat the application. For external use. Do not use on wounds or abraded skin. Avoid contact with the eyes,mouth and mucous membranes. Do not ingest . Do not inhale. Keep out of reach of children. It contains ammonia.